Last month's most talked about game collides with the latest shiny thing to grab our attention in a video created by McArctico. They've edited a bunch of flashy finishers and slick kills in Apex Legends in the style of the original Borderlands trailer, complete with Ain't No Rest for the Wicked accompanying all the showing off. 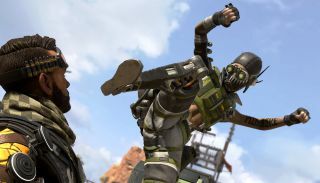 The song's doing a lot of work, but Apex Legends is a pretty stylish game and those finishers are great trailer fodder. It's a real treat to see so many finishers actually finish, since I'm invariably murdered whenever I attempt them. One day I'll learn to look before I make myself a sitting duck. I'm much more partial to Borderlands 2, but it's the original intro that I immediately remember whenever anyone says "Borderlands". We've yet to see the Borderlands 3 intro yet, but Gearbox has already shown a bunch off, teasing lots of details in the reveal and announcement trailers. To find out what we've dug up so far, check out everything we know about Borderlands 3.